Hand made in Italy in an area famous for the production of high quality leather goods, this golden brown watch strap is made from vintage style leather with rice coloured detail stitching. It is a thick strap, suitable for larger watches and designed to mimic a vintage or aged strap that will therefore have some dents or marks on it when it arrives, as you may see in the photographs, and will develop crease marks when it is bent. Rosario Italy watch straps are handmade in Italy by skilled artisans using high grade materials. They offer quality watch bands at market leading prices. 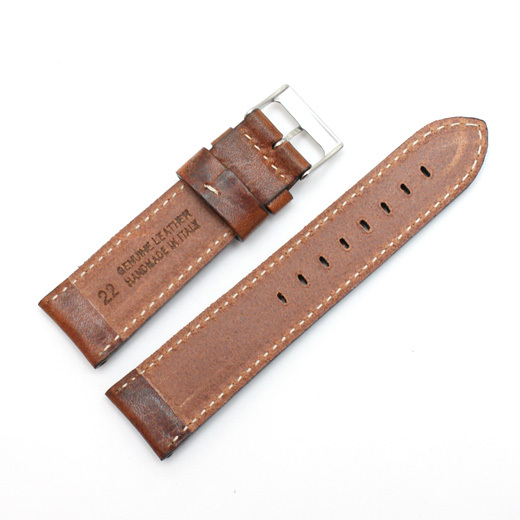 This strap will fit any watch where the distance between the lugs is 18mm, 19mm, 20mm or 22mm (depending on the strap you buy). Like all of our products, it is brand new and in stock in the UK, ready for our super fast shipping. Regular length: buckle section (strap end to spring bar): 75mm; holed section (spring bars to strap end): 115mm. 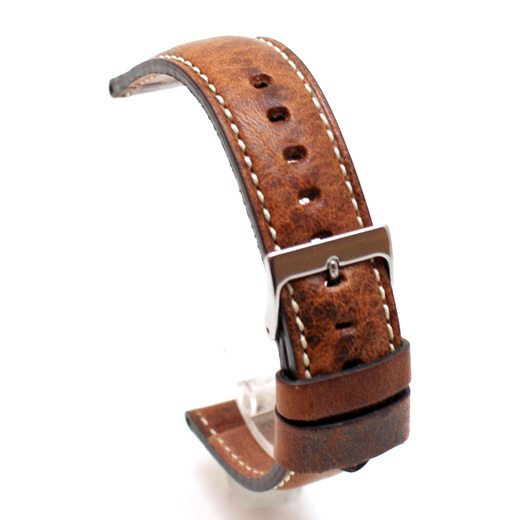 Buckle: This strap is available in two different buckle widths in 20mm lug width only. Please be careful when selecting the combination. Not exactly what you are looking for? 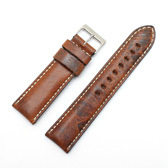 We have a wide range, see the mens vintage watch strap gallery for our other options.